Plate 23 of 'Hindoo Excavations in the Mountain of Ellora near Aurangabad', engraved by Thomas Daniell (from the drawings of his deceased friend James Wales), which Daniell regarded as the sixth set of his 'Oriental Scenery'. 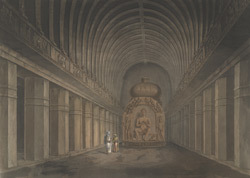 The interior of the chaitya hall of the 7th century Vishvakarma cave, the last important such chaitya hall made in western India, is divided into three aisles by 28 octagonal pillars with plain bracket capitals (omitted in the print). Above the columns there is a frieze of ganas, dwarf attendants and preaching Buddhas with Boddhisattvas. The vault of the ceiling is carved with ribs imitating a wooden structure. In the far end of the central nave there is a large seated Buddha in the teaching position carved on the front of the votive stupa, with attendant Bodhisattvas.